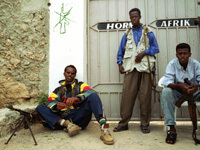 A decade after the disastrous US humanitarian intervention in Somalia, HornAfrik, the first independent TV and radio station in war-ravaged Mogadishu, was established by three brave Somali-Canadians in the face of chaos and devastation. Their vision was to forge a path to peace through freedom of expression, impartial news, and debate. The station's talk shows have become incredibly popular, providing a unique way for Mogadishu's marginalized residents, including women's groups and human rights advocates, to speak out without being silenced. It is a venture not without danger; HornAfrik has been attacked more than once by angry warlords displeased with the station's content. Despite the perils, the founders of HornAfrik continue their broadcasts, creating a blueprint for the role of the media in times of conflict. "Talk Mogadishu is a fascinating account of running a radio and television station, HornAfrik, in a dangerous city and a failed state...it provides a close and inside look at the rigors of providing balanced and sometimes controversial coverage of events in an environment where there is always some group that will take offense. Talk Mogasishu is historically accurate and contains useful visual material on the largely destroyed capital city of Somalia. It also demonstrates how the Somali diaspora can make a positive contribution to its country of origin." "Demonstrates the resourcefulness, courage and essential family values that are part of every Somali that I have known. The film deserves wide distribution, and it shows why the world should not abandon Somalia." "Highly recommended...HornAfrik continues its effort to rebuild Somalia by encouraging the free exchange of ideas and national reconciliation. It has become a model for using media to promote peace in a society actively involved in civil war... [Talk Mogadishu] is well paced and engaging." "Inspirational...A welcome addition to public library DVD shelves, ideal for showing in high school and college classrooms, Talk Mogadishu deserves the highest possible recommendation for its spotlight on how media has the potential to bring light to the most troubled of times and places."